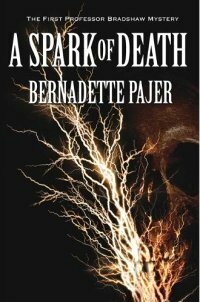 A Spark of Death by Bernadette Pajer. Release date: July 11, 2011, pre-order now! I got my advance copy via NetGalley. I made the mistake of starting to read this book very close to bedtime. I was quickly drawn into the story, and found myself staying up entirely too late. It was with great difficulty I reluctantly set the book down to sleep, only to take it up again as soon as I could the next day. And so I finished it in two sittings, and could have easily finished it in one if I had started reading earlier in the day. Be forewarned, it's a very engaging read. The story is set in Seattle (which is what attracted me to it on NetGalley) in 1901. This is a meticulously researched Seattle, with only very minor details different from the real world. I was expecting another Steampunk novel but I got lovely historical fiction with just a touch of mad scientist brilliance. Did I mention that it's well-researched? As a Seattle-area native, I had no problem following the action, even the visit to Snoqualmie Falls, and loved the short history lessons that managed to sneak into the text (like the dynamiting of Seattle Rock at the Falls in 1900 and the great Seattle fire). The story itself is a non-stop push against time and unknown consequences, as Professor Bradshaw is suspected of a colleague's death and must figure out how the murder happened to clear his own name. Having read a lot of Agatha Christie lately, I cannot say this one equals her best work, but it's certainly as strong as many of her mysteries. I'm sure a true mystery aficionado or an electrical engineer would have figured it out sooner than I did, but that's just quibbling. The action presses forward at a pace that, as I've already said, makes you want to keep reading. The characters are a tiny bit weak in some areas. There are some standard types in the cast, and only the main character is deeply explored. But the characters serve the story well and by the end I really want to read more about Bradshaw, at the least, even if the people around him aren't quite as compelling. As this is the first novel of the author, and the first in a series to boot, I think I can forgive those issues in anticipation of seeing this writer grow and develop. I'd recommend this book to mystery fans, historical fiction fans, and electrical engineers. It's a safe book for almost all ages, except for the murder bits, but I'd think only teens and older would get enough of the historical references to really appreciate the book. This is a good read, and I enjoyed it a lot. I love the well-researched bits that you managed to seamlessly fit into the book. I adore good historical fiction, and this really qualifies. Looking forward to the second book, now. My Mom did the telephone operator thing once upon a time, so that bit is going to be close to my heart. Neat, I'll have to look into that one when it comes out. I think you'd like it, David. It's a good read. You do like mysteries, right? Yes, I like a lot mysteries, sci-fi, fantasy, historical fiction (some of it), steampunk and a bunch of other genres.